Get and try Solar Alert App today! Want to stay up to date with our latest news and events about Solar Alert App? Subscribe to our newsletter then. We promise, we wont spam! We've already added your email! We'll keep you up to date with updates and news about Solar Alert App. Opps!! You dont fill all required field correctly. You will be able to take necessary precautions to reduce risks associated with defects in the functioning of telecommunications. You will be able to avoid air travel because there is a high risk of general failure in aerial control systems and propulsion of aircraft in flight in case of an extreme solar event. You will be able to disconnect and electromagnetically isolate your appliances in time to protect them from devastating power surges. Because your safety and the safety of your family is most important, now you can have the best early warning system designed to protect you and your family before the arrival of the extreme solar storm, to avoid the fires that will occur because of the intense electrical overloads produced by the solar event. You will be able to reschedule your car trips, since, on the day of the arrival of a solar storm, transportation systems may be severely affected, which may cause accidents. You will be able to avoid severe obstacles posed by the failure of electromechanical systems such as trains and elevators in buildings when assistance with freeing you can take days to arrive. You will be able to be alert and prepared for possible earthquakes caused by intense solar activity since there is a statistically demonstrated relationship between the two phenomena. You will be able to move away from nuclear installations in time because the safety of nuclear reactors can be severely compromised, which can cause very severe health risks for the population living within a radius of 200 kilometers around the nuclear power stations concerned.. Solar Alert is the complete security system that will protect your life against the dangerous effects of the expected big solar storms. This important event will cause disasters such as accidents on all types of transportation, massive lack of food and water, for months or even years, and overloads in electrical networks that will render useless the appliances of millions of homes, causing massive fires in homes and buildings, where the lives of thousands of people will be at risk if they are not alerted in time. 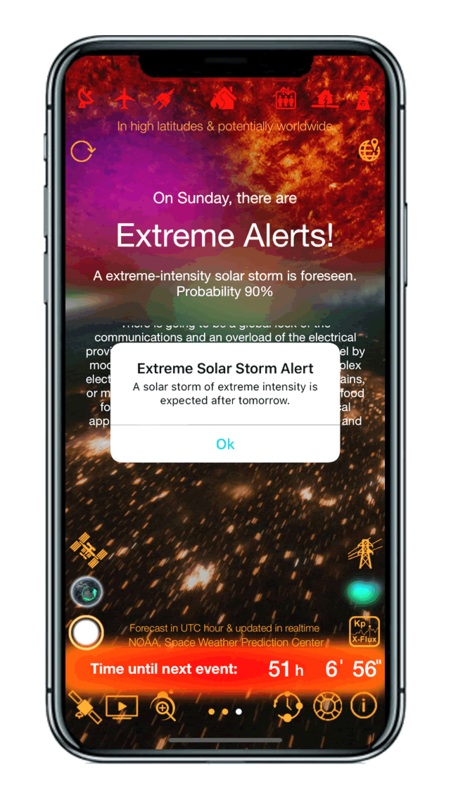 "In a brief, simple and clear fashion, but also with plenty of technical data if required, Solar Alert warns you of possible obstacles presented that you and your whole family may have when dangerous solar storms occur; events that NASA scientists have already warned will undoubtedly occur in the coming years." Algorithm that analyzes the data supplied by the agencies NOAA and NASA, calculates the alerts with accurate time, and displays the recommendations in summary and in a language that is easy to understand for all users, allowing you to act with an advance of up to 3 days to be able to protect your life and your entire family. Automatic early warning system that works in the background with remote monitoring and also provides precautions and actions to be performed depending on the alert level indicated. A visual timer that provides a countdown of time remaining until the arrival of the solar storm. 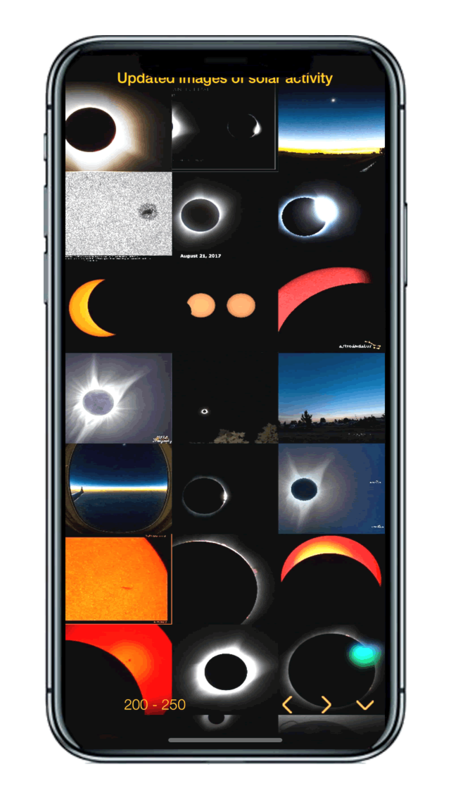 Easy and comfortable access to graphics and images of the Sun, supplied by the observatories of the space agencies NASA and ESA, as well as NOAA, all updated every few minutes. Menu with the list of preparations and precautions to take before the arrival of a severe solar storm. Information based on the recommendations of the agencies FEMA, ICDO, and NASA. 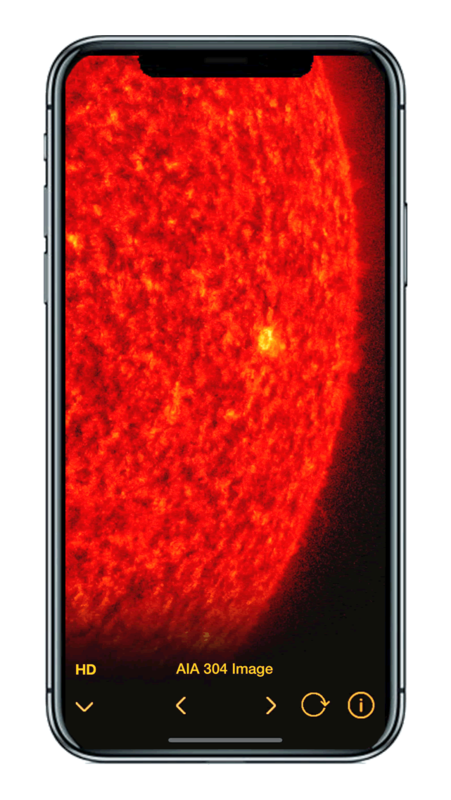 Solar Alert has the best early warning system on Apple iOS devices so you can prepare properly and get to safety even before official mechanisms evaluate what to do in the face of the big solar event. Your home will be the first to be prepared. Thanks to Solar Alert, you will have useful recommendations and advice so that you can prepare yourself conveniently days in advance and ensure the well-being of your entire family, as well as that of all your household goods. For those interested in the most technical details and also in observing the solar activity in detail, Solar Alert has the most beautiful images of solar activity and auroras recently obtained from all over the world. Because we take care that your user experience will be the best and that your satisfaction will be complete, you can count on our expert support to resolve all your doubts in the fastest and most efficient way. We upgrade Solar Alert free of charge to work with the latest versions of Apple's iOS to meet precise security and reliability requirements. All forecasts and alerts produced by Solar Alert and its associated services are supported by information obtained from certified data sources such as NASA and NOAA. We assure all of our subscribers that they will be able to save their entire family from the upcoming Carrington event or extreme solar event. Top of the line App. Most informative App I've found. Thank you for such a great App. This App deserves a 10 of 10. 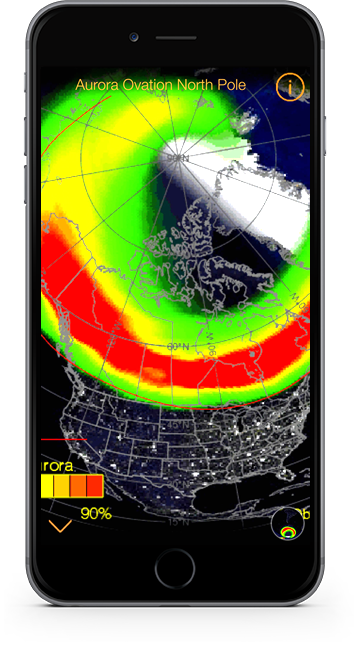 Are you interested in Aurora Borealis This definitely is the app you would want It has everything you need to know. From when Solar Flares will happen, With real time video availability, even where International Space Station (ISS) is In real time! 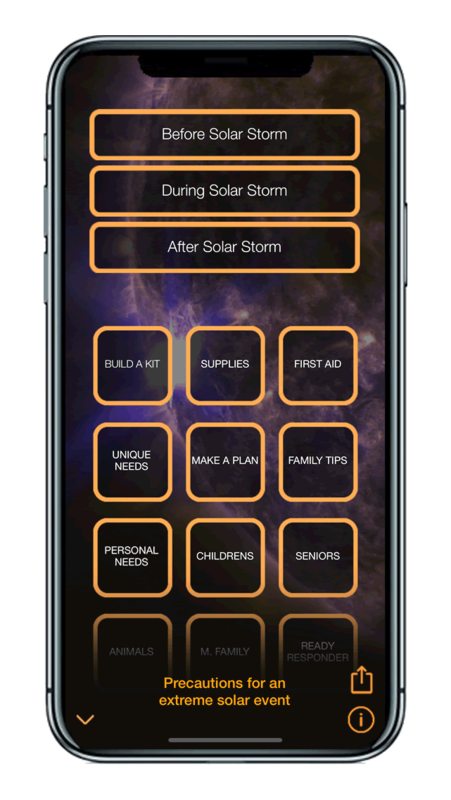 PLUS extra information on what to do before, during and after a full blown Solar Flare alert that would affect business and home grids. This is absolutely the BEST science app I’ve come across. I’m so glad I purchased this one. I freaking love this app so terribly much! It’s super beautiful super informative and super useful! It makes me feel safe in this world and it makes me smile. Constantly updated and always accurate. Great information - great app! All kinds of great information and will alert if there is solar weather to be concerned about. Very interesting for my family. This app is nicely made and very easy to understand I like knowing when there are CME's coming and how strong they are going to be makes me feel safe thank you to the makers of the app awesome job. One of my favorites. Simple to use in planning nighttime photography...especially aurora hunting. I do a fair amount of Aurora photography. This app is accurate, with very useful information, great for predicting Aurora arrivals. Highly recommend it to anyone interested in Aurora predictions and interested in protecting their electrical equipment. Très belle application et très utile pour la prévention. Merci!. This app is packed full of features. Anyone keeping track of potential electrical storms (solar flares) should check this out. These are just a few of the visual features available at Solar Alert. 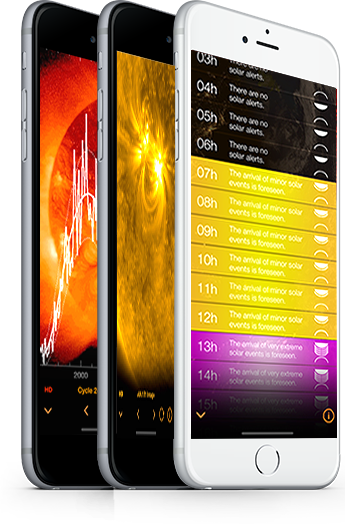 From only 2.99 per year you can enjoy the best and most complete early warning system for the next extreme solar event, the Carrington event that can reach us at any time. Certified scientific documentation about the importance of the impact of a Carrington event on our society. Audiovisual informative resource about the effects of solar activity on our planet. Personalized tactile test so that you can know how the next extreme solar storm will affect you. Algorithm that calculates the alerts and displays the recommendations in summary allowing you to act with an advance of up to 3 days to be able to protect your life and your entire family. Visual timer that provides a countdown of time remaining until the arrival of the solar storm. 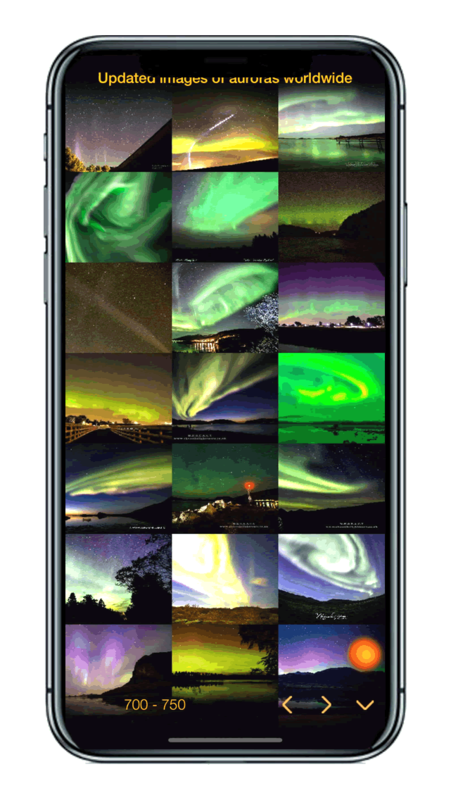 Easy and comfortable access to thousands of beautiful aurora images recently produced worldwide. Easy and convenient access to the most important technical data related to solar activity. Easy and comfortable access in real time to images taken from the International Space Station from where you can observe solar activity as plasma reaching Earth. Geolocalized forecast with time accuracy for the next three days so that you can know how solar activity affects you. You pay after the first trial month, never before. 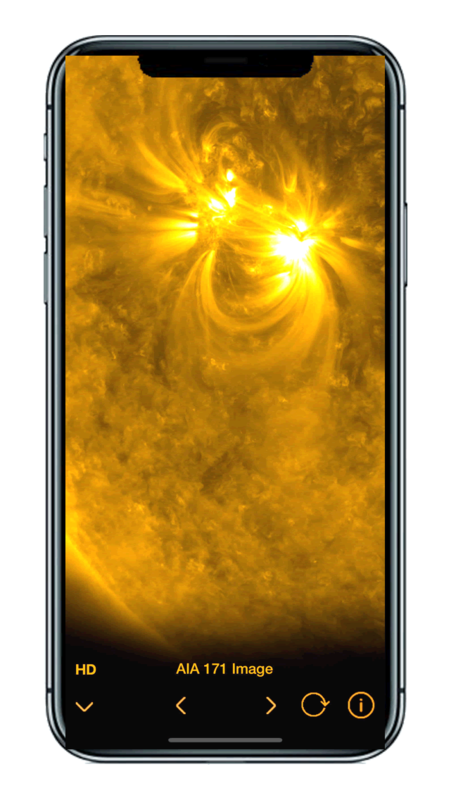 The best way for you to check the quality of Solar Alert is by downloading our App on your Apple iOS device and starting the trial month, it's totally free! If you have any questions using Solar Alert App, within Solar Alert App you have the option to contact our technical support. If you wish to contact us directly from here, you can do so by pressing the button below, we will be happy to help you.